If you’re like me, we both love books. In fact, the photograph at the top of my blog shows a picture of favorite books from my childhood that I still have (and still love to read!). To find out more about the books I’ve written and also a little bit more about my world, please visit my website at www.nancyisanders.com. If you’d like to contact me, please send an e-mail to jeffandnancys@gmail.com. 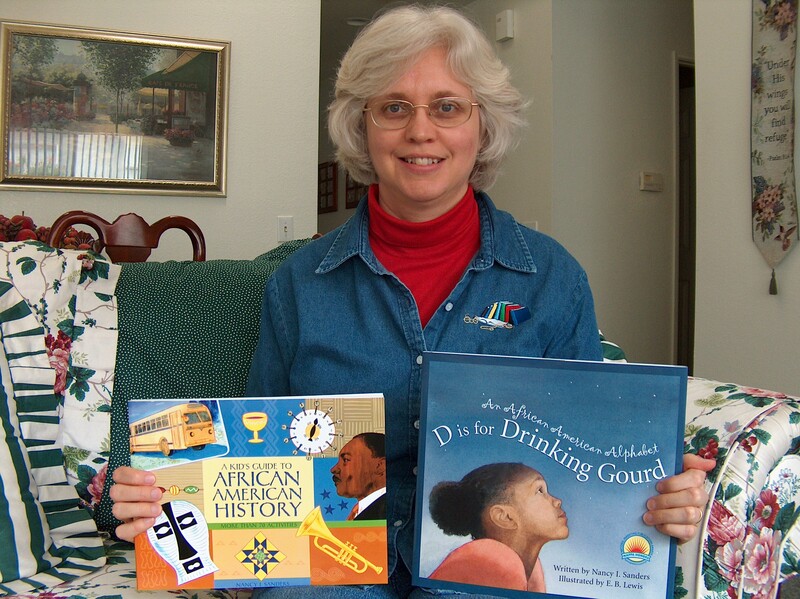 To read a review of my book, D is for Drinking Gourd: An African American Alphabet, visit the blog Nurturing Young Readers. You can also learn more about my book by clicking on the link to listen to a live interview at Book Bites for Kids on BlogTalkRadio. Listen to an internet radio interview with Scott McCausey at Christian Devotions Speak Up! Listen to an interview with Rick Green about my children’s book, Adventures in Odyssey Imagination Station #13: The Redcoats are Coming! CLICK HERE on the link to Wallbuilder’s Live! then scroll down the page of archives for February 2014 to hear my interview on February 11, 2014. Yes! You Can: This site is all about my book for writers and how you can build a successful writing career. Bookzone: This site lists more information about my books. Teacher + Writer: This is the site I provide tips for teachers on incorporating literacy and the love of books into their classroom. America’s Black Founders: This is the site of my book about African Americans during the founding years of America. WriteShop: This is a link to an article I wrote about the importance of reading with your children. It’s part of the introduction to a curriculum I’m writing to teach children how to write. These books are published by WriteShop and this is their site. Explore it and find products ranging from kindergarten to high school that will help you teach your children how to write. Scribes: This is my inspirational photoblog for writers. The Sunflower Series for Women: Visit this site to find Bible studies to purchase for personal or group use. One Hour Each Day: This site tells about my daily journey to meet with God and offers tips and inspirational encouragement for you to establish this daily commitment in your own life as well. Your life will never be the same! 7 Healthy Habits: This site will help you prioritize your life so that God is Number One!